in a move that will cheer up the farmers, the process of paddy procurement at minimum support price (MSP) has begun in Hailakandi district of Assam. 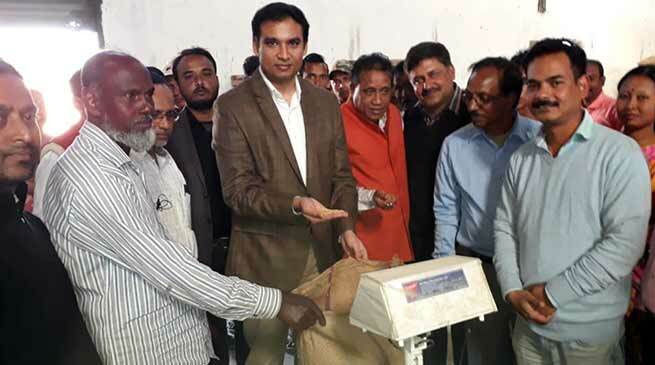 The paddy procurement at the Paddy Procurement Centre at FCI, Lalabazar was ceremonially inaugurated by Deputy Commissioner, Hailakandi, Adil Khan in presence of District BJP President, Area Manager FCI, Assistant Director, Food and Civil Supplies and other dignitaries on Saturday. MSP has been fixed at Rs 1,750 for common paddy and Rs 1,770 for Grade A paddy as against the prevailing market price ranging from Rs 1,300 to Rs 1,400 per quintal. DC Khan said higher support prices would increase the ‘purchasing power’ of farmers, which would have a ‘wider impact on the economy’ by enhancing the income of farmers. It would help to eliminate the middlemen who generally reap the benefits at the expense of farmers and also prevent farmers from making distress sales, he added. “Procurement has begun immediately after harvest thanks to the initiative taken by DC. Anticipating a good harvest this year, procurement is expected to be good,” said Sub Divisional Agriculture Officer, AR Ahmed. Nizamuddin Majumder of Kanchanpur village sold approximately 35 quintals of paddy at MSP. PRI members present expressed satisfaction and assured all sorts of help to the farmers.